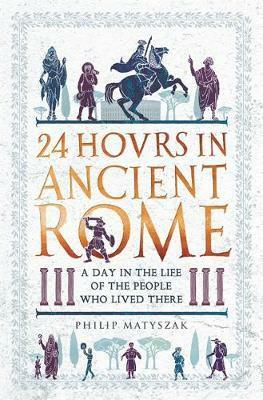 I came across Matyszak’s 24 Hours in Ancient Rome: A Day in the Life of the People Who Lived There via a recommendation by Alison Morton (of Nova Roma fame). It looked right up my alley, so I jumped straight into it. Very glad I did! A witty, fictional non-fiction description of the lives of representatives of the Roman multitude, around the time of Hadrian. Matyszak takes a random day, and starting from midnight moves through the lives of the ‘little people’ who made up the million or so inhabitants of Rome at its prime. Each hour sees the ‘story’ shift to a new person, as they go about their business. I loved the mix of fiction and non-fiction. Using the stories of fictional(*) people to highlight the daily lives, and then digressing on to passages of explanations of what they are doing and why; their whole world – the whole city – through their eyes. The book is written with charming wit – it’s not often that a non-fiction book leaves one in stitches. (*) Fictional, but not entirely made up. Matyszak uses names as found in graffiti, burial inscriptions, surviving quips from contemporary writings, etc. He also provides us with a glimpse into these, by quoting the original references. Martial, Juvenal, Apuleius, Pliny (both elder and younger), Petronius, and many others – all contribute their words. Matyszak uses the windows they afford us into daily life in ancient Rome to breathe life to those characters. This is neither a history of grand events, nor an academic discourse about the sources and their interpretation, or comprehensive review of evidence. Matyszak uses a framework of fiction as an educational tool to teach us about the lives of ordinary Romans, hinting at the depth of evidence behind him. It also reflects life in early 2nd century CE – a thin slice out of the millennia long history of Roman culture. I absolutely loved how Matyszak brings ancient Rome to life. Reading his stories, one walks, sees, smells, and is totally immersed in the great city. I find well-researched historical fiction a great learning tool, so this combination was perfect for me. I would heartily recommend this to anyone interested in ancient Rome, whether reading or writing about it. This books does a tremendous job in educating the reader in a way that sticks. (A small note to fans of Felix: this book is ‘set’ about three hundred years after the period I based Egretia on. It’s mostly applicable, though some deviations are expected). I like your formatting for reviews, it’s new 🙂 . Great blog post!! I try to set expectations – I think that’s the best service for other readers.